Admissions in different degree programs are announced officially by the National College of Arts NCA Lahore for the academic session 2018. All the National, as well as foreign students, can apply for the admission at NCA through a procedure mentioned in the advertisement as well given in the next section for the information and guidance of the students. The NCA Lahore offers admissions 2018 to students in a variety of degree programs including B.A, B.Sc, BS, MA, MSc, MS, MPhil and different diplomas and courses for different disciplines Architecture, Fine Arts, Interior design, Visual design, Textile design, Multimedia arts etc. National College of Arts Lahore NCA recognized by the Govt. of Pakistan as the pioneer institution of Arts and design in 1963. This is considered as one of leading institutions offering quality education to the students, in the field of art and design. Procedure for getting admission in NCA Lahore and last date to apply for admissions 2018, NCA admission advertisement 2018, detailed fee structure, admission form download, and complete admission procedure for academic session 2018 is described below. NCA Lahore has announced the opening of admission in different study programs as advertised in the newspapers for the year 2018. This institution is serving the nation by providing an excellent environment to the students of art, textile, fashion, and design. Admission advertisement 2018 is published in most national newspapers as well as on the official website of NCA Lahore. The NCA official website contains information about Degree programs, fee structure, complete merit list for admissions 2018 in different degree programs, results in 2018, merit-based scholarships, Last Date to apply for admission and guidelines to apply for the admission. UOL Admissions Schedule can also be checked here. Last Date to Apply: 25th May 2018. Admission in short courses (Film Production Fiction and Television): From 26th May 2018. Check out COMSATS Lahore Admission Last date also for the application process. Find complete information about NCA latest admissions in below advertisement. The last date to apply, admission procedure and eligibility condition requirements thoroughly. The fee structure is different for the open merit and self-finance seats. NCA Lahore Fee Structure 2018 for different degree programs can be view online by click Here. Must check out LUMS Admission and UMT Lahore Admissions in Fine Arts and Engineering fields. Submit your application forms before the deadline. 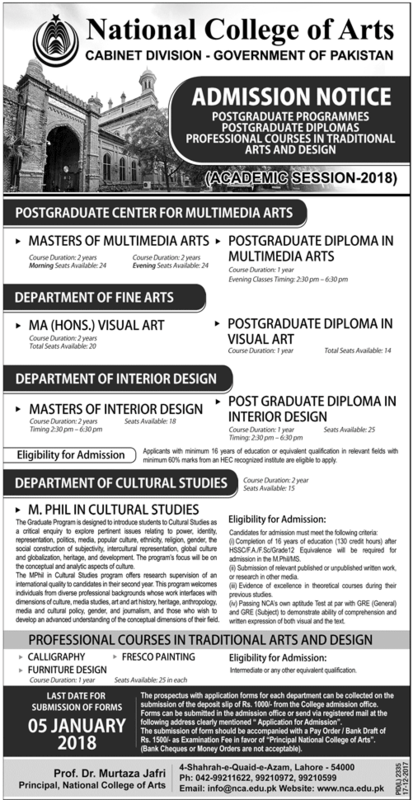 National College of Arts, Lahore offers 06 months diploma & certificate in Post Graduate Center for Multimedia Arts, Department of Visual Communication Design, Architecture and Department of Film & Television. Last date to apply is 5th July 2018. Detail of all these certifications and courses is given Here. Candidates who wish to apply for the admission for the academic session 2018 should get the Admission form from the college by paying Rs. 1000 or Download Admission Form 2018 by clicking Here and depositing the amount in favor of NAC Lahore at the designated bank branches. Submit the duly filled form on or before the last date for admission as advertised. 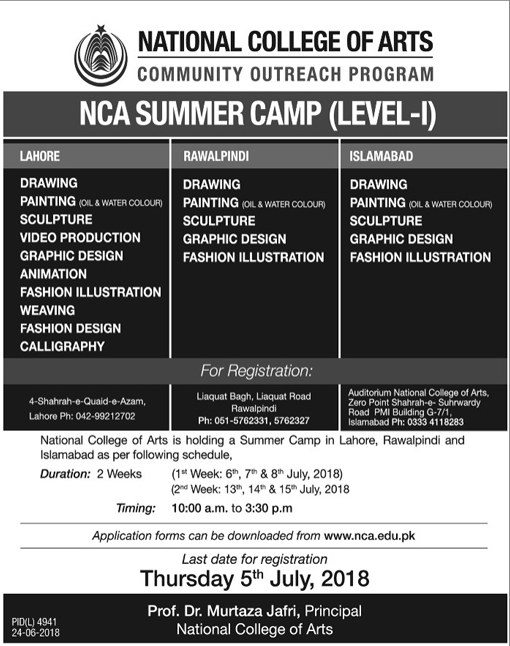 NCA Lahore offers equal opportunities for the male and female students to get enrolled in this institution having an aptitude for visual arts and design. For admissions into different degree programs, NCA conducts admission test in different provinces of Pakistan. Students who pass the admission entry test and having at least 45% marks in the last degree are eligible to apply for the admission at National College of Arts Lahore. NCA Lahore is one of the oldest and prestigious institutions having highly qualified professors and administration to offer the latest and advance degree program of MS and MPhil level. The admission 2018 in various MS and M.phil program are announced by the NCA. These Mphil and MS Programs include Communication and Cultural Studies, Interior Design, Multimedia and Visual Arts. Planning is underway to launch the many other advanced degree programs. NCA Lahore offers admission in the spring and autumn semester for the degree programs and in different types of diplomas and short courses of six months and one-year duration. Merit Lists for admission into different types of study programs offered by NCA are displayed on the official website of the college for the year 2018. National College of Arts has declared results 2018 for the different discipline including the BA, BSc, MA, MSc, MS, MPhil and Diploma programs in architecture, interior design, Fine arts, Music, Culture, Product Design, Textile Design etc. Students are advised to check their result by entering their roll number and degree program for which they are seeking the declared result. NCA is looking to raise the education standards by motivating the young and talented students by providing financial assistance and scholarships to the students having excellent grades in their studies. Poor and needy students are also offered numerous types of scholarships funded by many different organizations. Some of the awards and scholarships offered by the NCA for the students are Haji Sharif Prize, Shakir Ali Award, and Kipling award etc.